Saturated buffers are vegetated strips of land—as little as 30 feet across—between tile-drained agricultural fields and waterways. 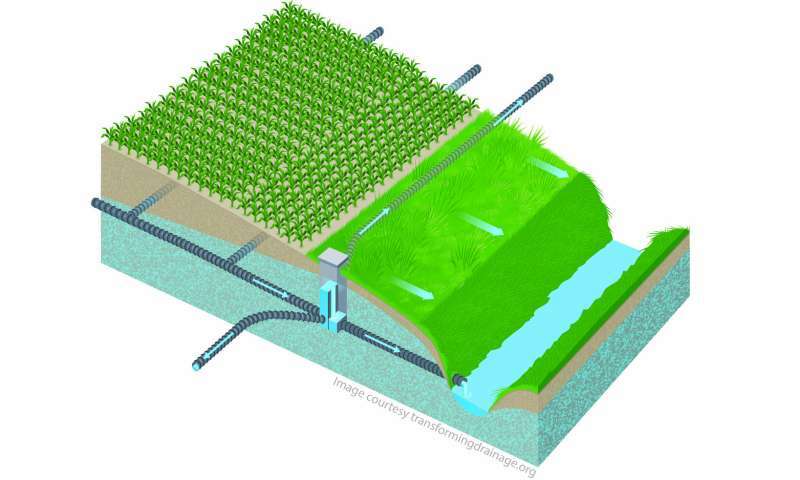 Ordinarily, tile pipes carrying drainage water from the fields empty directly into ditches or streams. With a saturated buffer, the water is re-routed to a perforated pipe running below the surface and parallel to the stream. Water then flows through the soil of the saturated buffer into the stream. Along the way, soil microbes naturally remove up to 44 percent of the nitrogen. Laura says the approach required a lot of assumptions. For example, there are no satellite images or maps for tile drainage systems across the entire Midwest, so the researchers made the assumption that corn or soybeans fields on soil characterized as "poorly drained" were most likely tiled. However, Reid notes tile drainage systems are installed under many corn and soybean fields in the Midwest, not just poorly drained ones. "Overall, our assumptions were relatively conservative. We probably underestimated our figures as a result," he says. The paper, "Saturated buffers: What is their potential impact across the US Midwest?" is published in Agricultural and Environmental Letters.